It has long been clear that health care in America is a disaster, an overpriced and underperforming bureaucratic behemoth. It has also been clear that the answer is Medicare for All, aka Single Payer Health Care, a tried and proven solution to the problems of health care in modern, developed societies. It is also true that a majority of Americans favor such a system. But alas, we have no such system here in the US. How to get it is one of the pressing political and humanitarian questions of the day. 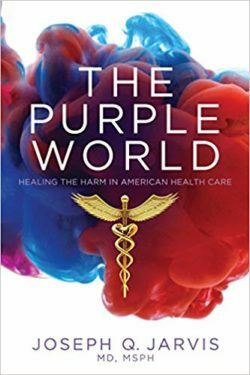 The Purple World: Healing the Harm in American Health Care, a new book by Dr. Joseph Jarvis, suggests some interesting answers. Much of this book deals with Dr. Jarvis’s years as one of the two leading public health officials in Nevada. This part is engaging, enlightening and a bit scary at one or two points as Jarvis relates his struggles to ensure proper public health standards. For example, a convention center restaurant wanted to cover up a case of food poisoning that disabled hundreds of conventioneers. Or proper protections were not being enforced in Nevada’s brothels, leaving both employees and customers at risk. At one point the brothel employers let Jarvis know that they were well aware of where he and his family lived! It read like a scene out of The Godfather. The brave Dr. Jarvis was not stopped. Many of these tales are very revealing about the practice of medicine and public health and they make for spell-binding reading. But the main interest of this book is a discussion of how to get Single Payer, and the book opens some interesting new angles on this effort. For starters, too many seem to think that Single Payer only has appeal for liberals, progressives and Leftists. Dr. Jarvis is living testimony that such is not the case. He is a political conservative and a devout Mormon; and in this book, we find him pressing the case for Single Payer with great passion. And he has done so tirelessly for decades in op-eds, lectures, interviews and even twice running for the Utah legislature. The lesson is that the movement for Single Payer must be broadened to appeal to those who share Dr. Jarvis’s conservatism. Single Payer must not be perceived as a wholly owned progressive enterprise. That means uncoupling the crusade for Single Payer from other programs that Left leaning activists advocate. There is no reason that Trump populists cannot embrace Single Payer every bit as much as Bernie Sanders populists. From this comes the book’s title The Purple World. In both Democratic and Republican primaries, voters showed their independence and admirable irascibility by turning from the Elite Party leaders to the upstart populists, Trump and Sanders. With voters more willing to think for themselves rather than act according to Party establishment diktat, the question must be asked how Single Payer can be made attractive to conservatives. As I noted above, one way is to decouple it from other progressive issues. It must not be seen as simply another plank of a Left-wing platform. Opposition to coal mining or to gun rights, as examples, should not be made a prerequisite for Single Payer advocacy or a condition for working hand in hand with progressives in the Single Payer movement. And meetings of Single Payer activists, should not drift into such areas which are guaranteed to make conservatives feel unwelcome. In other words the crusade for Medicare for All must be made into a solid single-issue effort that spans parties and ideologies. In this regard Single Payer activism has much to learn from the struggles for legalized abortion or gay rights or equality for women which grew to span Parties and ideologies. And it might take a cue from Ralph Nader’s book Unstoppable which advocates just such Right-Left alliances. With this appeal in mind Jarvis suggests that in the new populist post-2016 environment we turn to winning Single Payer one state at a time. In sum, a Purple World, Tenth Amendment approach to Single Payer. But why not simply go the federal route? The answer is that our Congress is in thrall to the Insurance Company Giants who are in control of most health care in the US and therefore make a bundle from it. The Insurance Behemoths have been especially powerful in Washington, virtually writing the ObamaCare legislation which codifies and extends the control of the Insurers over the health care system. There is no doubt that the Insurers also have great influence over State politicians. But, in general, the more local the government, the greater control the people have over it. And most importantly States have the ability to enact laws by referendum, so Jarvis’s irascible voters can bypass the politicians entirely. Still even in the arena of the referendum, there will be a battle between truth and money – and it will not be an easy battle for the truth. One problem with the Purple World, Tenth Amendment state by state approach is that it too requires an act of Congress. Congress needs to provide enabling legislation to exempt states from various federal rules and regulations that preclude a Single Payer system. It is here that the Tenth Amendment approach becomes valuable for it would have appeal to many principled conservatives in Congress. They might then join an increasing number of liberal Congresspersons to enact such a bill. And such a measure could enjoy the support of both conservative and progressive/liberal populists at the grassroots level. With such a law in effect each state could attempt to win single-payer. This would be the Purple World in action. Such enabling legislation or something very close to it was proposed in the past by former Democratic Congressman Jim McDermott of Washington. And McDermott’s successor, Democratic Representative Pramila Jayapal has submitted such legislation again. Perhaps even more interesting, as Jarvis informs us, Republican Senator Mike Lee of Utah stated in a TV debate in his election bid in 2011 that each state should be allowed to fashion its own policy for health-system reform, even if it meant the state would create a single payer system. That statement came in answer to a question posed by Dr. Jarvis who lives in Utah. The existence of such a bill in Congress would also open the door for votes coming from both Republicans and Democrats, with Republicans able to side with it in a way that is compatible with their Tenth Amendment outlook. And this would also satisfy another prescription of Jarvis: voters must ruthlessly hold politicians to their promises. The very existence of such a bill in Congress provides a way to put each member of Congress on record as a co-sponsor – or not. The irascible populist voter can demand that both conservatives and progressives back such a bill -or give their vote to an opponent of either party who will back such a bill – both by co-sponsorship and by vote. All of a sudden Democrats must compete with conservative Republicans for the populist voter demanding Single Payer. There would no longer be a single Party monopoly on Single Payer. Dr. Jarvis fleshes out this proposal by sketching the outlines of such a Single-Payer bill for his state of Utah. It merits examination, for as usual there are demons lurking in the details and these demons must be routed. There is now a debate among Single-Payer advocates about which path to take, the national path or the state path. Some suggest that only the federal path is possible and that state-based approaches would distract attention and divert energy from the national project. But it is equally true that the two approaches can be complementary, stirring up general interest at all levels. Two wise and very knowledgeable members of Physicians for a National Health Program suggested to this reviewer that both approaches be pursued since it is impossible to tell where a breakthrough will occur. The single-state approach would follow in the footsteps of the proven, successful single-province approach in Canada. There single-payer was first instituted in the Province of Saskatchewan in a mighty and bruising struggle. But it then spread like wildfire to all the provinces. Perhaps California or Washington – or Utah – could be the Saskatchewan of the US. Let 50 flowers bloom! This article was posted on Thursday, September 6th, 2018 at 5:58pm and is filed under Book Review, Democrats, Health/Medical, Republicans.